Our 2017 Alzheimer Society Research Program recipients are hard at work building cutting-edge insights into the treatment for Alzheimer’s disease. 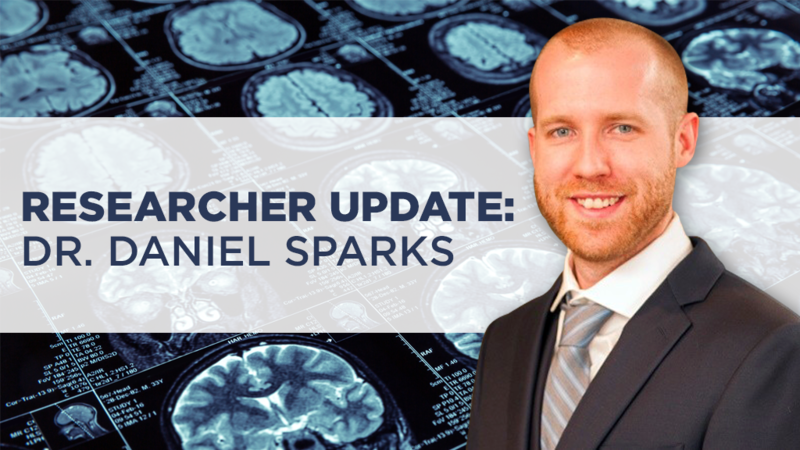 Dr. Daniel Sparks is bringing novel insights that may narrow down on the cause of Alzheimer’s disease. Support researchers like Daniel today. The Alzheimer Society Research Program funds new research initiatives every year, targeting two types of research: Biomedical and Quality of Life. Since its inception, the program has funded an incredible $53 million in grants and awards. Last year, Dr. Daniel Sparks was awarded the Biomedical Award for his research studying the cause of dementia. We connected with Daniel a year later to hear more about what he’s been working on. Since receiving my Alzheimer Society Research Program fellowship in the summer of 2017, I’ve been working on several exciting projects to understand how Alzheimer’s disease appears in the brain. My goal is to develop new methods for overcoming the attention deficits that appear early in the development of the disease. Attention deficits: looking into why these deficits occur and what specific neurotransmitters might be involved. Age and attention span: early data suggests that neural function is not disrupted in people living with Young Onset Alzheimer’s disease, but age does show an increased difference between people living with dementia and those without. The interpeduncular nucleus: examining this relatively unexplored part of the brain that may be affected by Alzheimer’s disease. The interpeduncular nucleus regulates behaviours like: anxiety, aversion, and spatial memory[i]. With all of this fascinating research underway, Daniel is looking forward to the next steps for his work. The funding I have received from the Alzheimer Society Research Program has allowed me to pursue several promising lines of research concerning the neural basis of Alzheimer’s disease and how attention deficits caused by Alzheimer’s can be treated. Already, I’ve been able to publish this baseline research[ii], and published a manuscript on the interpeduncular nucleus[iii] . I look forward to continuing this research and sharing even more exciting updates from my research program soon. You can do something about dementia today by supporting researchers like Daniel, through the Alzheimer Society Research Program. Click here to support more exciting research initiatives like this.